Pick yours today for best selection. Hurry and get yours before the season starts! They won't last long! We also have an empty permanent site as well as a few seasonal sites that are waiting for you to bring your camper and enjoy our beautiful resort! Call 1-800-337-8550 for more info or to set up a time to come take a look. Site 97 for sale, A 1996 36' Dutchman that sleeps 8. 40' X 10' covered deck, comes with a storage cabinet on deck, 2 ceiling fans, refrigerator, and much more. site rent of $3200 paid through Dec. 2018. Asking $18,000. Contact Joe or Delores at 812-838-3977 or 812-483-3054 or 812-483-8179. For sale, Site 127 a 2010 Forest River Camper. 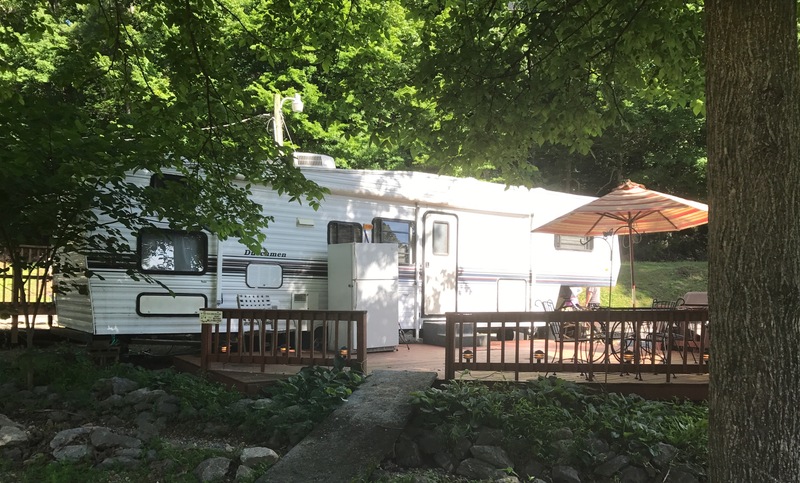 Camper has a full roof over with covered porch and sleeps 8. site rent of $3300 paid through Dec. of 2018 asking $28,500. for more details contact Rick at 270-993-1613. For sale site 106. A 2015 Coachmen Liberty Edition 310BHDS bunkhouse. This is a 32' camper with dual slides, sleeps 9-10 people, has a master bedroom with new queen bed, Bunk house has 2 singles and a full futon. Also features Fire place, 32" flatscreen LED lighting, Central AC and much more. Site rent of $3200 has been paid through 12-31-18, Asking $33,500. Call Gary at 618-269-4060 for more info. For sale site 65. A 2007 32' Jayco Eagle with 2 slides. Comes with TV DVD, Microwave, King Bed, outdoor lawn furniture and swing. Removable deck. Site rent of $2900 has been paid through Dec 31 2018. Asking $12,500, Call Steve at 270-881-6213 for more info. For sale site 66, A 2007 Outlook Keystone 25' with bed slide. Bunk beds, full kitchen, also outdoor kitchen. Bath with full shower. Camper is like new, used very little. Site rent of $2900 paid through Dec 31-2018 asking $11,000. Call Darren at 270-543-1827 for more info. For Sale. 2008 Jayco BHS on Site 104. Fully covered RV and 10’X40’ deck. Queen bed with ample storage in main bedroom. Bunk bed with trundle in second bedroom. Sleeps 6 to 8 people. Amenities are full size fridge, electric fireplace, fully furnished including patio furniture and grill. Water view and parking for boat. Site rent of $3200 paid through Dec 31 2018. Asking $30,000. Call Tom @ 270-860-4383 if interested. For sale site 85. A 1985 33 Ft Prowler. Camper has a full roof over with covered porch. Everything stays, also comes with a utility bldg on a quiet shaded lot. Site rent of $3200 paid through Dec. 31 2018. Asking $10,000. For more info call 812-477-3408. For sale site 32. A 33' 2002 Fleetwood Prowler with one slide that sleeps 6. Comes with Patio table and chairs, swing, Refrigerator with bottom freezer and much more. Site rent of $3300 paid through Dec. 31 2018. Asking $13,000 Price reduced to $11,000 for more info call Joe at 270-952-3385.